Posted July 6, 2018 by Steve & filed under Productivity. You get the Office Web Apps with your Office 365 subscription, so you can work on your cloud files from any up-to-date Web browser on an Internet-connected computer. You don’t have to install the Office software on the computer. 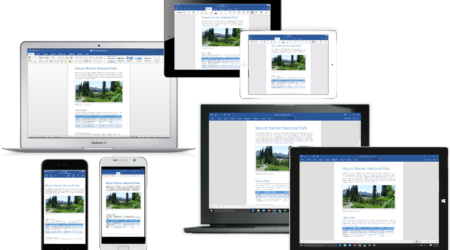 You also get access to Office Mobile Apps so you can use Word, Excel, PowerPoint, Outlook and OneDrive directly from your smartphone or tablet while you’re on the move! Download them from your Android or iOS device store. Collaborate online and see each other’s changes as they happen with real-time coauthoring in Word. Save your file to OneDrive or SharePoint so others can work on it with you. You can share it directly from the application, thanks to the integrated sidebar. Upload your file to Office 365’s cloud storage. Write an email using Outlook (or Outlook Web App). Instead of attaching a file, insert the link to the file on your cloud. Outlook will automatically grant edit permission to the people you are emailing. You can change the permissions anytime you want. Finished editing your document, spreadsheet, presentation or publication? Converting it to a PDF is made simple with the Save as PDF integrated feature. If you want to edit a PDF, you can convert it into a Word document without the formatting issues that come with copy-pasting or editing. Office 365 Planner is new! It will help you and your colleagues plan workflows and organize collaboration. Use this project management tool to create plans, organize and assign tasks, share files, set due dates and provide status updates. All this work is done with through email notifications and visual dashboards. Version control has been improved with Office 2016 co-authoring. You can see which changes were made, by whom and when. You can also revert back to a previous version of the file if necessary. Your OneDrive storage is synced to your device, so you can choose to work offline on files. As soon as you reconnect to Internet, the new versions will be automatically uploaded to your storage. The new version will also be sent to any other connected device.